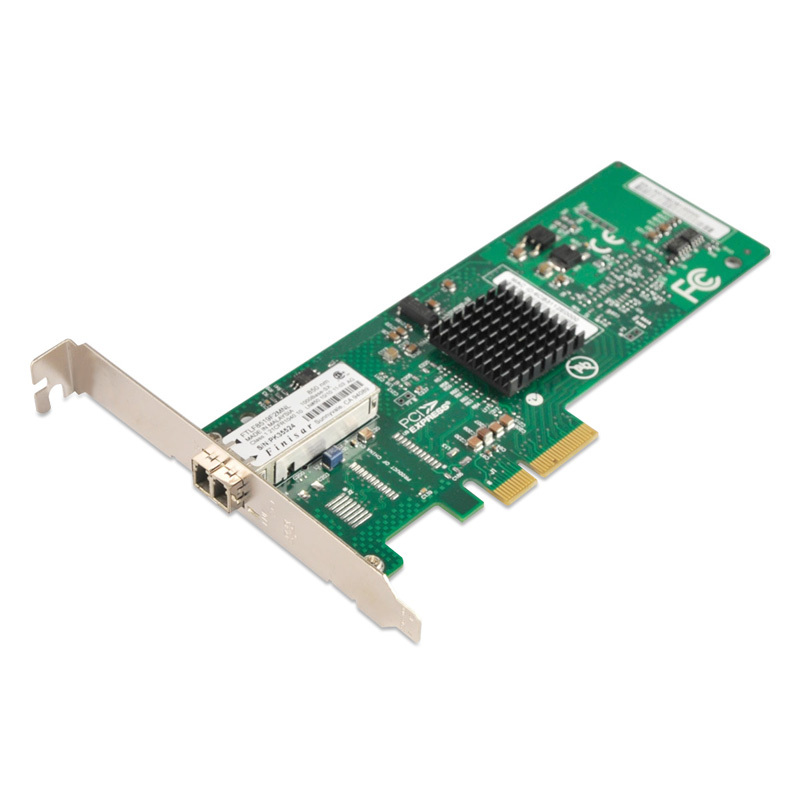 The NIC-9710PF is a high performance PCI Express multifunction server network adapter for either standard or low profile slots in ProLiant servers running over a fiber-optic network environment. In addition to delivering Gigabit Ethernet networking, the NIC-9710PF supports TOE (TCP/IP Offload Engine) for Windows only, Internet Small Computer System Interface (iSCSI). Up to 1000Mbps Ethernet transfer rate delivers outstanding network performance that improves response time and removes bottlenecks across the entire network. TCP/IP Offload Engine (TOE) for Windows moves the processing of data in the TCP protocol stack from the server CPU to the network card, freeing CPU cycles for other duties. The NIC-9710PF supports TOE when Windows TOE Chimney is installed. With TOE, network communications are improved, and server efficiency is increased. Accelerated iSCSI allows the NIC-9710PF to multi-function as both as a network adapter and as a storage host bus adapter, thereby providing access to storage platforms and to servers over a single connection. Additionally, the NIC-9710PF offloads the iSCSI software to the hardware for improved performance. Accelerated iSCSI on 1GbE multifunction server adapters purchased as options ships as a standard feature, at no additional charge. Transmit Load Balancing (TLB) and Switch-Assisted Load Balancing (SLB) are two advanced features used to build a bigger pipe for improved networking bandwidth. These port bonding techniques enable users to use up to eight adapter ports in a ProLiant server and aggregate their throughput up to a theoretical maximum of 16 Gigabits per second full-duplex transmission. The NIC-9710PF can be configured with other NC-series Ethernet server adapter teams supported on ProLiant servers. When running as a standard Gigabit adapter, the NIC-9710PF features TCP Checksum Offloads as well as TCP Segmentation Offloads and Interrupt Coalescence. These features reduce the load on the CPU for overall improved system response. Interrupt Coalescence is a feature that groups multiple packets and issues a single interrupt to the host.This process improves host efficiency. Network Fault Tolerance, sometimes called "failover" or "NIC redundancy," allows for the installation of multiple NIC-9710PF server adapters or other network adapters so that the active device can be backed up by a redundant adapter to improve availability. The HP teaming utility also allows users to specify that when a failed adapter is fixed and replaced, the original adapter resumes its function as the primary network connection. Enable initial diagnostics within Windows, Linux, and DOS operating systems.Configure network adapter teaming in a Windows environment. The Windows adapter teaming configuration utility includes a patented teaming GUI for Microsoft Windows 2000 and 2003 operating systems.Support for scripted installations of teams in a Microsoft Windows environment allow for unattended OS installations. A single bracket LED indicator shows link integrity and network activity for easy troubleshooting.